An easy, 4-ingredient recipe for rich dark chocolate truffles. Truly guilt-free with no heavy cream, melted chocolate or sugar involved—and just 23 calories! Nearly every year, I end up stopping by the grocery store or Target to pick up a few things shortly after Valentine’s Day. After grabbing a shopping basket, I completely ignore my list and head straight to the back of the store to the section of Valentine’s Day items, reduced to 50%+ off for quick sale and to clear up shelf space for Easter displays. This year, the people in my town apparently avoided dark chocolate and bought all of the milk chocolate hearts, M&Ms, and peanut butter cups instead. I nearly did a little happy dance in the middle of the aisle—that meant I found some of my favorite treats by Ghirardelli and Godiva! I also spotted a stack of small white boxes with “Assorted Gourmet Chocolate Truffles” scripted across their tops. Without a description of the truffle flavors, I supposed most shoppers skipped over them, and even though I typically prefer to know a little bit more about my chocolate box’s contents, rather than leave it as a complete surprise, I decided to take the risk for the mere $2 price tag. That evening, I peeled off the clear plastic packaging, slipped off the lid, and peered down at the candies: half milk and half dark. I lifted the box to just below eye level, trying to closely inspect each and predict its filling flavor, before selecting a dark chocolate truffle and taking my first bite. As I slowly savored the candies over the next few days, I felt fairly underwhelmed. Although they looked fancy, they lacked flavor… They mostly tasted sweet and sugary, much more than chocolaty! Since they failed to truly fulfill my rich chocolate truffle cravings, I decided to whip up my own homemade batch of these Healthy Dark Chocolate Truffles! With no heavy cream to heat or chocolate to melt, they’re incredibly simple to make (you just need 4 ingredients! ), and even with their incredibly decadent flavor, they’re only 23 calories! Which means I have absolutely no guilt if I take a second one. ? Like I said, these are so easy to make! 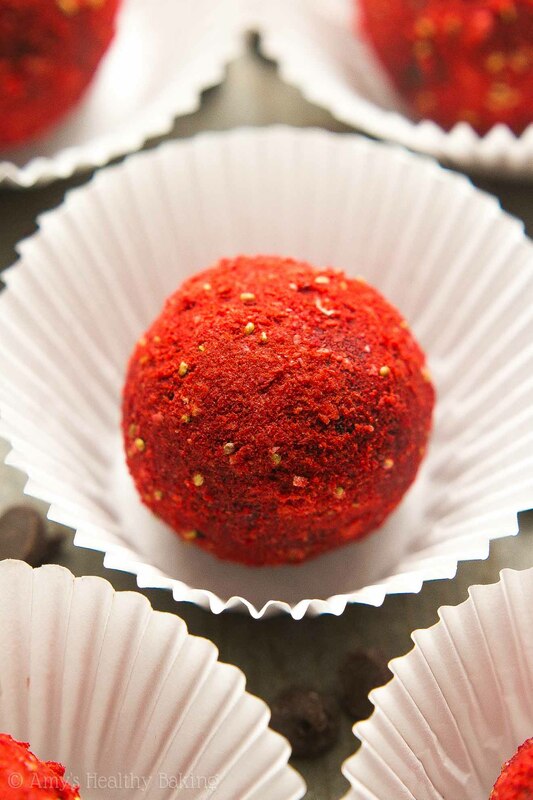 Mix everything together in a bowl, chill, roll into balls, and toss in a special coating. That’s it! So let’s take a minute to talk about the ingredients before you get started. First, you’ll need unsweetened cocoa powder. Just the regular kind! Because the cocoa powder provides the entire chocolate flavor (and you’re using 1 full cup! ), there’s no need for Dutched or special dark. These truffles already taste very rich and dark without either of those! The strawberry purée is exactly what it sounds like: strawberries that have been pulsed in a food processor or blender until completely smooth and liquidy. Both fresh or frozen and thawed will work! 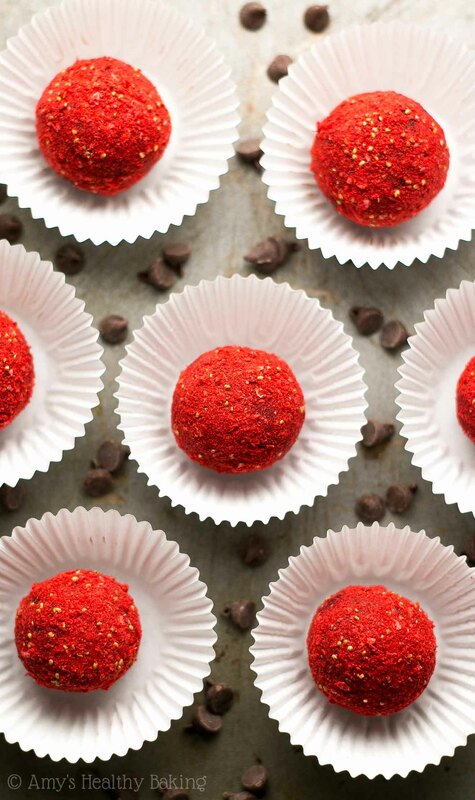 Since the strawberry purée’s flavor is very subtle, you’ll finish the truffles by rolling them in crushed freeze dried strawberries. I’ve found them at Trader Joe’s and Target! Just add them to a zip-topped bag, and gently tap them with a rolling pin or frying pan until they turn into a fine powder. Then transfer that powder to a small bowl, and simply roll your truffles around it in until they’re fully coated! How decadent (and cute!) do these look?? ?? And when you make your own, remember to snap a picture and share it on Instagram using #amyshealthybaking and tagging @amyshealthybaking IN the photo itself! (That guarantees I’ll see your picture! ?) 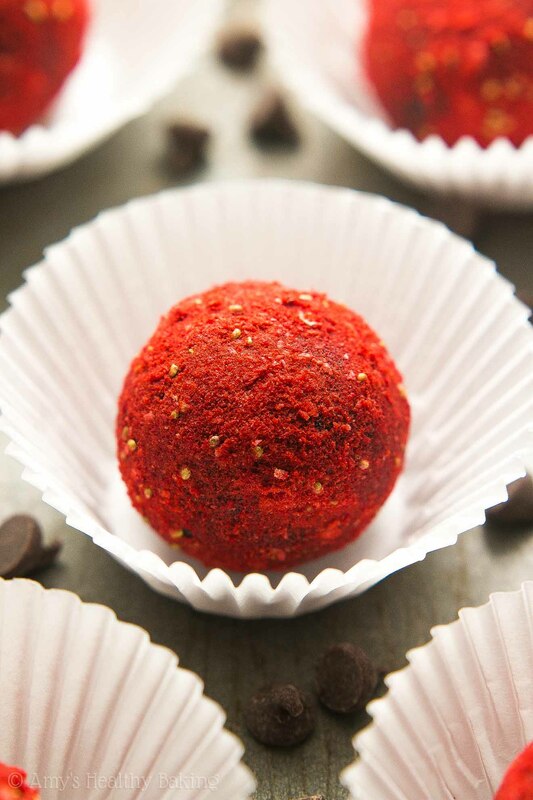 I’d love to see your truffles and feature them in my Sunday Spotlight series! These truffles are so easy to make, and they taste just as decadent as ones you’d buy from the store! They’re similar to 72% dark chocolate. They’ll keep for at least a week if stored in an airtight container in the refrigerator. While the mixture chills, line a baking sheet with wax paper. 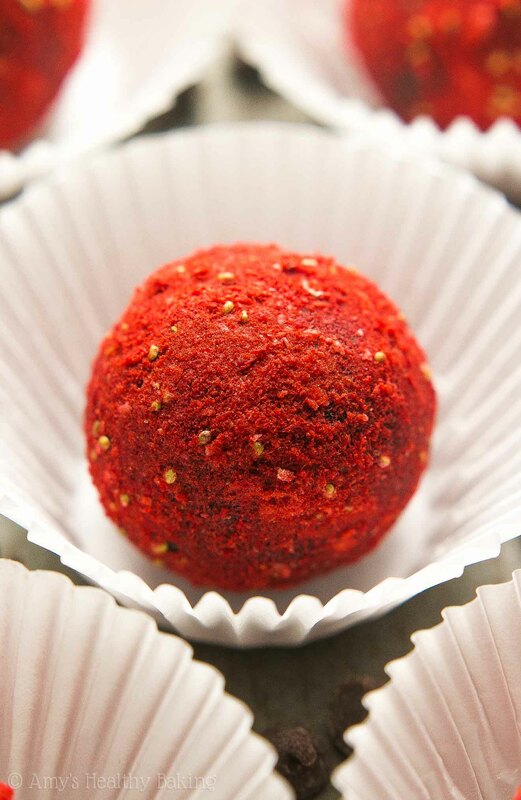 Add the freeze dried strawberries to a zip-topped bag. Press out the air, and seal. Add that bag to another zip-topped bag, press out the air from that bag, and seal. Gently crush the strawberries with a rolling pin, pan, or plate until they turn into a fine powder. Transfer the power to a small bowl. Remove the chocolate mixture from the refrigerator, and roll it into 16 small spheres. 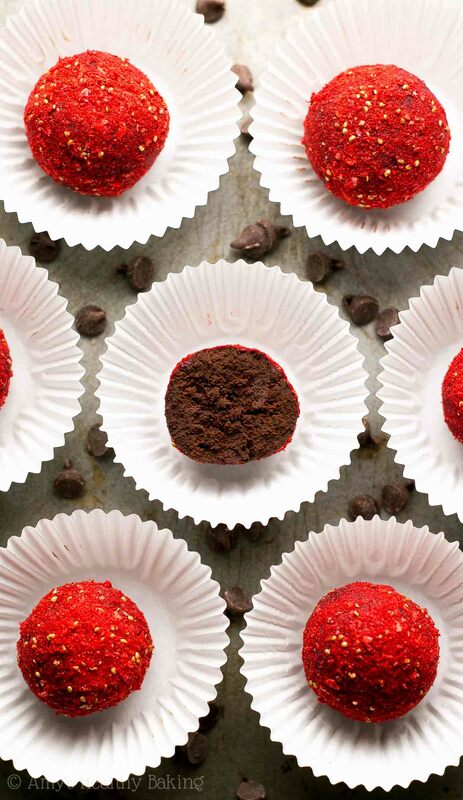 After shaping each truffle, roll it in the freeze dried strawberry powder, and place it on the prepared baking sheet. Once all of the truffles have been formed, transfer them to an airtight container. Cover and refrigerate until ready to serve. Notes: It’s important to measure the cocoa powder like this or with a kitchen scale to avoid adding too much. (Too much will dry out the mixture and make the truffles taste bitter!) The chocolate mixture requires quite a bit of stirring to fully incorporate all of the cocoa powder! If the cocoa powder hasn’t completely mixed into the other ingredients after a few minutes of stirring, add a tiny bit of milk (any kind will work), ½ teaspoon at a time, until the mixture comes together. For a sweeter chocolate component, add ¼ to ½ teaspoon of vanilla crème stevia along with the maple syrup. Alternatively, substitute additional maple syrup for an equal amount of the strawberry purée. 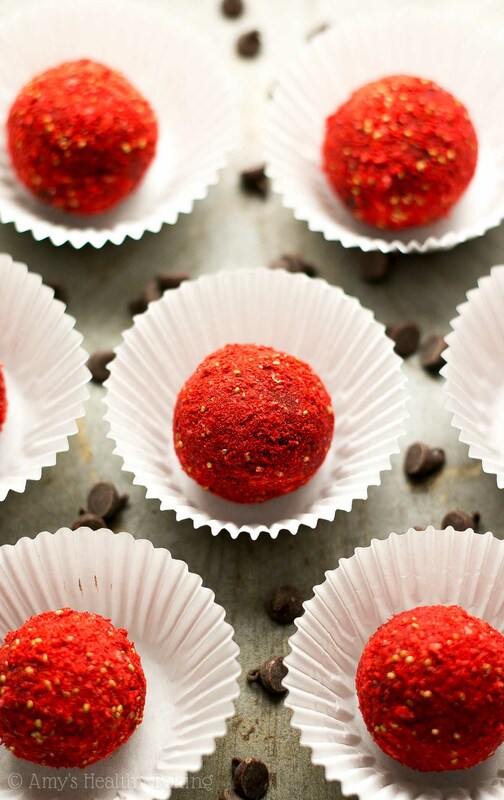 However, the truffles won’t have as strong of a strawberry flavor if using the latter option. I’ve found freeze dried strawberries at Trader Joe’s and Target! The chocolate mixture tends to stick to your hands a bit, so wipe off your hands with a damp paper towel after shaping each truffle. Here is my video on how to make truffles! These look superb!! Is there a way to incorporate some avocado without detracting from the strawberry flavor or sweetness? I really appreciate your interest in my recipe Terra! I’m actually severely allergic to avocado, and since I’ve never worked with it, I’m honestly not sure. 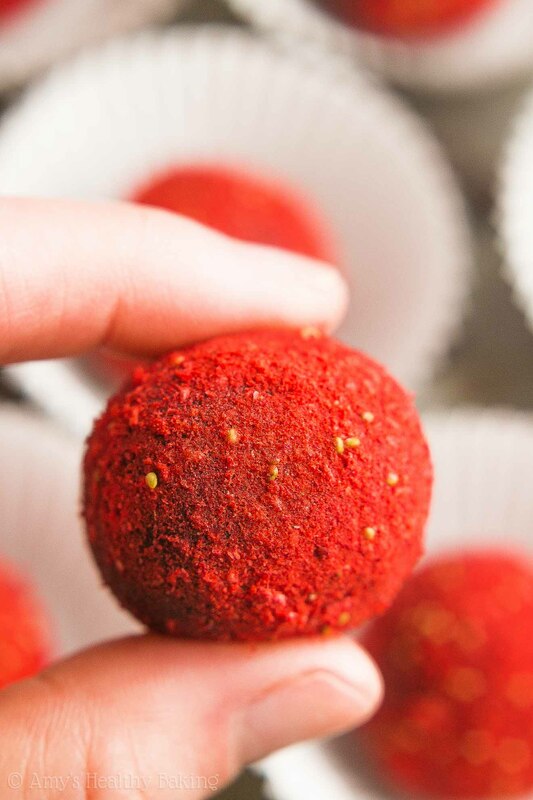 I’d love to hear what you think if you try these truffles!